Who is Saw Gerrera? Saw Gerrera is a rebel’s rebel, or, that is to say, an extremist. Saw Gerrera is so rebellious, the Rebellion no longer wants to be associated with him. It’s hard for me to imagine what Saw has done that was so extreme that the Rebellion said “Uh, no thanks” to him, but the breach between Saw and the Rebellion is bad enough that they’re worried about even approaching him without a good luck charm (ie Jyn). Most of the characters in Rogue One we find at a mid-point in their lives — Jyn is a prisoner who needs to join a rebellion to be reunited with her father, Cassian is a spy who needs to find a mission he can believe in, Galen is an engineer looking for a way out to redeem himself — but Saw we find at the end of his arc, after a lifetime of hard struggle. He’s paid a price for a lifetime of rebellion. He’s lost his legs, has lived in the same suit of armor for decades, and has trouble breathing, which makes him a rebel cousin to Darth Vader, which the movie even nods to at one point. Like Vader, Saw has let his rage consume him. Like Vader, he is a father-figure to the narrative’s protagonist Jyn. Like Jyn’s real father Galen, Saw has abandoned Jyn “for her own good.” Galen abandoned her because he was worried about the Empire finding her, and Saw abandoned her because he was worried about the Rebellion finding her. Dads of the world, hear me: no matter what, your child would rather be with you in a corrupted world than abandoned in an idealistic one. I find Saw’s end-of-life choice to an odd one for someone who has fought so hard for so many years. The Empire has just destroyed a nearby city, and Saw, rather than joining Jyn (with whom he’s just been reunited) remains to be destroyed by the ensuing tsunami of rocks and debris. The idealistic response would be to want to see the Empire pay for the destruction of Jedha, but the emotional response is that Saw, in sending Jyn on her path to reunion with her real father Galen, has fulfilled his purpose in life, and he welcomes the Empire’s death ray with a sigh of despair and even an embrace of freedom. Like Cassian, Saw has, apparently, done a lot of horrible things to get where he is, and the destruction of Jedha is finally, for him, a chance to let go. Chirrut and Baze are a classic yin and yang couple. Chirrut is a spiritual seeker and Baze is his muscle. While Chirrut focuses on his telepathic powers, Baze practices his aim with his custom-made two-part machine gun. That is, Chirrut speaks softly while Baze carries a big stick. Cassian says they are both guardians of the temple at Jedha, but only Chirrut looks particularly religious to me. Baze seems much more practical and down to earth. So the two of them answer two sides to the question: how does one rebel? Chirrut’s background is not as a soldier but as a spiritual idealist, a defender of an idea, not a warrior. He sees rebellion as moral choice: he rebels against the Empire for the same reason Gandhi rebelled against the British: it is the right thing to do. He does it not for revenge but in pursuit of spiritual enlightenment. He’s like a knight-errant in the time of the Crusades, pondering the suffering of Jesus, or a masterless ronin wandering the Japanese countryside pursuing the ideals of the bushido (his resemblance to Zatoichi, the Blind Swordsman makes the comparison clear). 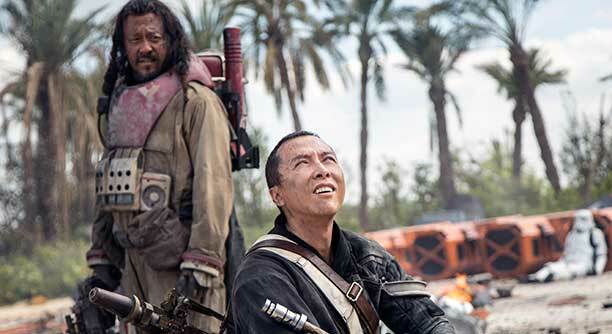 Given all that, Baze seems to me to be Chirrut’s long-suffering boyfriend, who doesn’t really understand all of Chirrut’s spiritual mumbo-jumbo but has seen enough of it work to know that Chirrut is special and in need of a strong pair of eyes and a stronger gun to bail him out when he’s in a jam. He rebels because that’s where Chirrut is going (he’s kind of like Chirrut’s Chewbacca that way) but also for much less spiritual reasons: he wants to kill the rotten so-and-sos who blew up Jedha and destroyed everything he’s ever known. Baze rebels because his back is to the wall; he’s got nothing left to lose. In this narrative about identity, Bodhi presents a more-complicated-than-usual case. An imperial pilot who defects to the Rebellion, Bodhi was already pretending to be something he wasn’t. 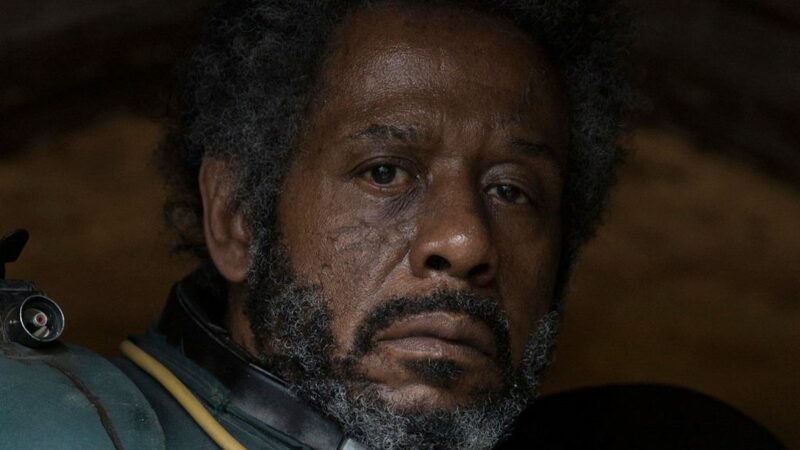 Once he gets to the rebel’s rebel Saw Gerrera, he discovers that no one cares who he is or is pretending to be, because they come from a world where no one is trusted to be who they say they are. As a result, poor Bodhi is tortured by Saw to the point where he forgets who he is, until Cassian reminds him. “I am the pilot!” he exclaims, it all coming back to him. What forces led Bodhi to renounce the Empire and join the rebels are left unclear, but he clings to the one piece of his identity he can: he is the pilot. Even then, when he joins the Rebellion, the Rebellion doesn’t want him, further frustrating his search for an identity. 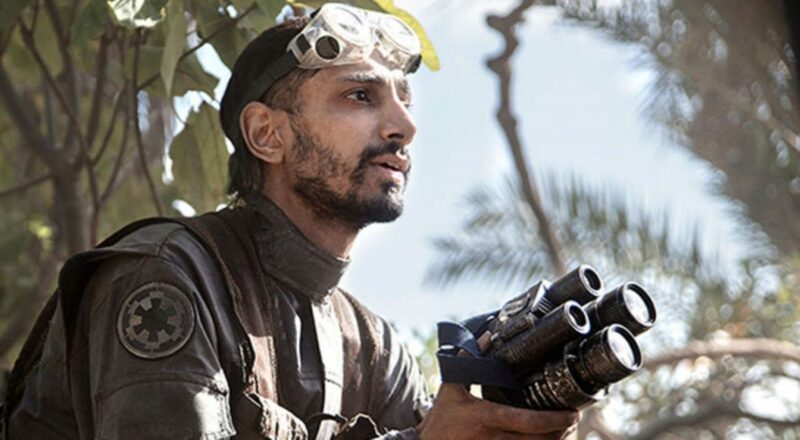 The moment at the end of Act II, when Jyn and the gang are stealing the cargo ship and Bodhi defines himself, and his team, as “Rogue One,” is his character’s apotheosis. Himself, Jyn, Chirrut, Baze, K-2SO and their band of assassins and spies are no longer outcasts and misfits, they are a team, a family, unto themselves. They’re not of the Empire, they’re not of the Rebellion, they are rogue, and they are singular. And finally, in our narrative about identity, we have our funniest, most unexpectedly moving reflection: K-2SO, Cassian’s Chewbacca, his robot sidekick, his paranoid android. K-2SO was an Imperial droid who was stolen and reprogrammed to help the Rebellion, and that reprogramming (in humans we call it “brainwashing”) has given him a permanent identity crisis. He doesn’t necessarily care about any rebellion, or about the lives of others, but he’s recently been given the gift of self-awareness and it’s shown him that life, his own anyway, is worth preserving. The most devilish joke of Rogue One is that a creature who has only just learned to live goes about it with such grouchiness and gloomy pessimism. Jyn says something about how you don’t care about flags when you’re looking at the ground, but K-2SO doesn’t know anything about flags at all, only that he once, they tell him, thought one way and now thinks another way. He hasn’t been given any choice at all. There’s a moment in Act III where K-2SO is walking through the Imperial base on Scarif and he encounters a droid identical to himself, and the two droids briefly make eye contact, that I find both very funny and deeply moving. In that brief instance, you see K-2SO silently reflect on the road not taken, and wonder if he is happier as a rebel or if he would have been better off if he’d just been another cog in the Imperial war machine. At that moment, it would not be too late for him to just kill Jyn and Cassian and call off the whole rebel attack on the base. He could go back to his life as an Imperial droid and forget all about the Rebellion, which awakened him to morality but denied him his innocence. In the end, what does it all mean? “Rebellions are built on hope” seems to be Rogue One‘s catchphrase, but the ending of the movie is pretty goddamned brutal, especially for a Star Wars movie. Jyn is reunited with her foster father, at the moment of his death, and then reunited with her biological father, also at the moment of his death, and then finds her own peace and ability to move forward with a new family at the moment of her own death. Chirrut looks for spiritual enlightenment, but Jyn finds the answer to a more satisfying question: “Who am I?” She, and Cassian, and all the crew of Rogue One all die without knowing if their rebellion was worth it, or if they only made things worse for everyone. Which, if I may, is a devastating message to deliver the weekend before the Electoral College meets to install the US’s own Director Krennic in the White House. The narrative finally leaves Jyn at the moment of her death to assure us that her message gets through, and, in so doing, gets its own message through: that rebellion against tyranny may consume your soul and may be a complete waste of time, but it is vitally important that you do so. I figured Saw asked to be left behind stayed he knew he couldn’t move fast enough to get out safely. Of course, he gets to the front door with shocking quickness, and the shockwave was travelling oddly slowly. I missed the my eye contact, I’ll have to look for that next time. It’s possible Saw may not have had trouble breathing, as I saw someone point out that he became noticeably more paranoid after each time he used the inhaler, even believing that his adopted daughter was only there to kill him. Maybe an addiction from some kind of painkillers to cope with his injuries? Or maybe he is a Frank Booth from a long time ago in a galaxy far, far away. Thanks for these posts, I’ve really enjoyed them. Re: your note about our homegrown Krennic, my wife and I attended an opening weekend showing in Oakland, neither with particularly high expectations about the movie (just because it was such an unknown commodity, and it didn’t feel nearly as important that it be good as “Force Awakens” did). After the staggering ending, the theater (98% of whom I’d wager were rebel sympathizers, if you know what I mean) exploded in a thunderous and emotional outburst of applause, which I think had as much to do with the general hopelessness of the past month as with the movie. The producers may not have intended that parallel, but it certainly worked.